Brrrr. I am so NOT ready for this weather. From 80 degrees on Thursday, we were lucky if we reached 48 today. Gloves, hats, fleece, winter coats—everyone came prepared today, and it was a good thing. Between the wind, the cold and the gray clouds, it seemed even worse than it probably was. But the horses love this weather. All the horses were very active this morning—at the very least trotting over for carrots, and in most cases running. Pops and Ring ran circles around their shed, kicking the wall every time they passed the back side. Run, squeal, bang, run, squeal, bang. Over and over. But I kind of expect bad, or at least entertaining, behavior from Pops and Ring. Along with Pops and Ring, you can expect Prized and Marquetry to show off, and they didn’t disappoint. Prized is kind of funny—if he is in the mood, he will accept carrots and pats like a perfect gentleman. If he is feeling a little cranky, he will take carrots but you better watch for his teeth. Today he was in a pretty good mood. He would let us get 15 or 20 feet ahead of him along the fence, then catch up at a floaty canter with his neck arched and his tail flagged. He moves like a youngster, pretty as can be. You and I is spending a great deal of his time trying to get the attention of the mares at the farm next door, but he is not opposed to interrupting his flirting to run over for some carrots. As soon as he gobbles his share, he wheels around and heads back toward his girls at a run. You and I looks absolutely gorgeous—he is black as midnight in his winter coat. When the light hits him you can see dapples, which is fairly unusual on a winter coat. And he is apparently vain enough to have very little mud on that beautiful black coat! It’s inevitable, I suppose, for any new horse to become somewhat obsessed with the carrot bucket. Sarava is no different. All of a sudden he has become a show-off who comes over at a run, tossing his head and posing for the cameras. And boy, you better give him carrots for his efforts! He is an awfully pretty horse when he poses for the cameras. I think his fame is kind of irritating to Patton, Sarava’s paddock neighbor. I can kind of see Patton rolling his eyes over the whole thing. We had some nice visitors today, among them a couple of ladies who had never touched a horse. I love that, because we have some horses they can pat to their heart’s content. One of the ladies kept remarking on how soft the horses’ noses are, which often seems to come as a surprise to people who have never touched a horse. And when the first horse you ever pat is a Belmont Stakes winner, well, that’s pretty cool! Commentator is back from his summer vacation in New York, looking for mints, as always. He is still the only horse I know who pins his ears back when you offer him carrots. I guess carrots are OK, but unless you have candy, Tator is bound to be disappointed! I think Zippy and Red are due to head back north shortly. I know probably should take more photos as we walk around on tours, especially on an active day like today. But there was one horse who was more interested in a nap, and I did get a photo of that. 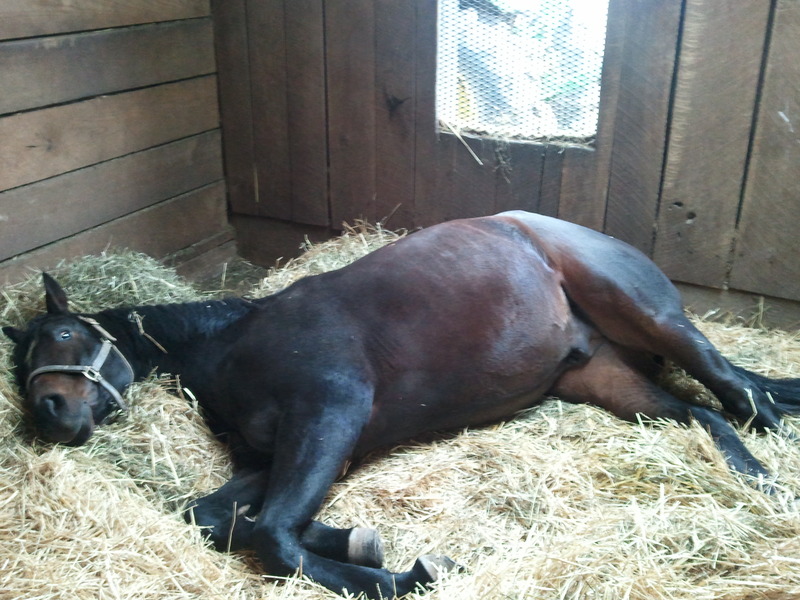 So, here is Arson Squad napping in his stall, after neatly arranging his hay as a pillow. See why I want to bring him home? I’m mixing things up this week with a Tuesday blog. (And no, this does not mean bad news from the farm!) I spent a couple different days at the farm this past week that weren’t Sunday, so I’m playing catch up. I wrangled about 40 elementary kids for a tour on Thursday, and spent a good part of yesterday visiting some of my favorite horses all by myself. Both days were immensely satisfying. I am sure you have heard the saying, “it’s like herding cats.” That saying should be amended to, “it’s like herding small children!” The kids were kindergarten through sixth graders, from one of the elementary schools in Frankfort. I will say this: these were some terrific kids. I told them no screaming or running, they didn’t scream or run. I told them to take turns, they took turns. In fact, I have had many groups of adults who were worse listeners than these kids. Watching the horses watch 40 kids is hilarious in itself. We started with Sarava, who was in his stall in the big barn. Now, Sarava is still settling in, but at this point he seems like a genuinely nice stallion. I opened his stall door and put the lead on him so the kids could meet him. He was deeply intrigued–for about 5 carrots. Then he backed up, turned around and let us know he was done. On the other hand, Afternoon Deelites would have stood all day, although he passed on the patting, thank you very much. No touching His Highness, I guess. Clever always loves kids and Ogygian trotted over from his shed, because kids are probably his favorite visitors. I brought Silver Charm out of his paddock and he was more than happy to be surrounded by kids. For some reason, Dan has always loved to squinch his nose in little kids’ hair, which always gets the giggles going. Special Ring’s lip trick was a huge hit, too–over and over and over! But then there was Marquetry. I’m telling you, if I didn’t love him before…let’s just say he is some kind of horse. As soon as our herd of cat, I mean kids, turned his way, he threw up his head and came at a dead run from the far side of his paddock, neighing the entire way. Marq then hung his head over the fence, closed his eyes and let 40 pairs of little hands reach over, under and through the fence to pat him, pretty much all at the same time. If you ever have doubts about how much an animal understands, you would only have had to see Marq with those kids to know that horses are so much smarter than we are. In a world where kindness often seems to be in short supply, Marq has plenty to share. Yesterday was a non-work day for me, so Marley and I decided to visit some of our newer horses, as well as some of the residents over at Merefield, our annex farm. (Well, Marley mostly wanted to see her dog pals Shane, John Wayne, Betty and Reggie. And she wanted to see her Aunt Bea!) I wanted to spend some time brushing Wallenda, which I did. Sleek summer coats are gone—the horses look to be about halfway to their thick winter coats. Wallenda looks like sheared black velvet, if you overlook the dirt, that is! But the sun-bleached look is gone, and it’s especially noticeable on the dark horses like Wallenda or Kiri’s Clown. In one of the paddocks at the annex, I watched bright red Early Pioneer, black Fabulous Strike and white Judge’s Case running across the bright green field. It was beautiful, albeit too quick for me to think to grab my phone and take video. Klassy Briefcase and Dancing Renee are quite happily ensconced on their paddock at the annex. They look like they have been friends forever. The other great change at the annex is Gasconade has graduated from a solo paddock to being paired up with Dinard. Gasconade came to us as a young stallion off the track with an injured ankle; after healing time and gelding, he is able to have a friend. Since Dinard is older and very calm, they make a good match. Not that Gasconade doesn’t try to instigate his new friend—it made me laugh watching him try his darnest to get Dinard going, without success. One of my other favorite horses at the annex is a gelding named WC Jones. Jonesy is a big, tall bay horse and he is kind of quirky. OK, by quirky, I really mean hard to catch! But once he gives up and realizes you aren’t trying to take him away from his grazing time, he loves attention. In fact, he is a cuddler—all 17 hands and 1300 pounds of him. He loves to be hugged and he’ll lay his head over my shoulder and nuzzle my face. Just don’t ever say the word “work” to him. He followed me around his paddock yesterday just begging for more love. He is impossible to resist. I finished up my day by visiting with Lou Brissie and my cutie pal Arson Squad. You know, Lou was a sleek, fit racehorse what, maybe 2 months ago? Uh-huh. Now he looks like a wide-bodied little quarter horse. In fact, a visitor saw him yesterday and said, “are you sure he isn’t a quarter horse?” Hey, Lou just makes efficient use of his caloric intake! Retirement is surely agreeing with him. And Arson Squad is doing fantastic. He outside time is increasing and he looks great. I don’t believe his ankle, with its pins and screws, hurts or bothers him much at all. That is just a miracle, isn’t it? I think it’s the contrast between how mentally and physically tough he is, and that intelligent cute face that gets me. Sadly, it’s just not practical to move him into my house. Sigh. It’s been awhile—again–since I wrote a blog, and there is a lot to catch up on at the farm. I will try to cover what I can! As you might know, we lost one of our mares this past month. Buzzovertomyhouse was probably not familiar to the majority of our visitors, as she never lived at the main farm. She has always been an annex horse, content to live a quiet life and hang out with her friend Klassy Briefcase. Visitors often ask me about the relatively few mares at the farm, compared to the boys, and why they are less visible to tours. The mares are funny—I think they are not as easily bribed with treats as the boys, and mostly could care less about visitors. We will miss Buzzy, but in truth, her retirement suited her perfectly. All she asked for was green grass, her good friend Klassy, and freedom to enjoy her simple life. She was a lucky horse! On the other hand, we have gotten a number of new horses over the past few weeks. The most recent arrived yesterday—2002 Belmont Stakes winner Sarava walked off the Sallee horse van about 8:30 in the morning. Sarava is the first winner of a Triple Crown race to retire to Old Friends and we are thrilled. Sarava beat some very good horses in that Belmont, including Derby and Preakness winner War Emblem and millionaire Medaglia D’Oro. You know, it’s really interesting to see the horses when they arrive at the farm. Each one is so different, and their initial behavior often seems to exactly mirror their personalities as we get to know them. For example, when The Wicked North arrived a few years ago, he strolled off the van, strolled out into his paddock, and within 20 minutes was at the fence greeting a tour and enjoying the carrot bucket. He probably settled in faster than any horse I have ever seen. The night Clever Allemont arrived, he was clearly tired, but he walked into his stall, calmly buried his nose in a pile of hay and began eating. He was sensible then, and he is sensible now. When Commentator arrived he raced Bull inthe Heather along the fenceline until they were both tired. Afternoon Deelites strutted off the trailer last year with his neck arched, letting everyone know He Had Arrived. AD was arrogant then, and has not changed one little bit! So when the door opened on the trailer for Sarava yesterday, I was interested to see how he would act. Sarava walked calmly off the trailer, looked around, and walked calmly over to his paddock. When Mundo let him go, he trotted back and forth for a bit, nothing too fast. He then wandered right over to Sunshine Forever in the neighboring paddock, where I am certain he said something like, “Hi. I’m Sarava. Who are you? So what’s the scoop on this place?” After that, I think a new set of pals were made, because when I stopped back at the farm later in the day the two stallions still seemed to be deep in conversation. Once Sarava existed the van, Marquetry loaded on for a short ride over to the Secretariat Festival in Paris. I wrote about this festival last year; I enjoyed myself so much I was more than happy to repeat as the Old Friends human representative this time around. It was fun again this year, and really, how often can you say that something is just as good the second time around? I find it hard to describe the Secretariat Festival because it kind of defies description. It’s small and quaint—the Bourbon County Fairgrounds are what you imagine a small county fairground would look like—60 years ago. Everything is sparkling clean and freshly painted, but there are no high-tech buildings or fancy food stands. Kids wander with their parents and grandparents. Burgers, fries and colas are the food of choice. Horses of different breeds are housed for the day in open air, slat-sided stalls. Sleek, fancy little show Shetlands pulling carts stand next to big, gorgeous Fresians in sparkly show saddles, across from stout appaloosa and paint ponies wearing tie-dyed leg wraps. It is a terrific place to spend a day. The great part of the Secretariat Festival is the number of people, from all over, who come to be a part of the Secretariat legend. Penny Chenery and Ron Turcotte were in attendance, which is terrific. Everyone is happy and cheerful when they come over to talk with us–they are genuinely thrilled to be a part of the day. It’sjust impossible not to absorb and respond to that feeling yourself. One woman told me she loved horses but was too afraid of them to get close to one. We fixed that—a couple of peppermints, an introduction to Marq and half an hour later, the woman was still patting him. Since many people knew our original intent was to bring Rapid Redux to the festival, we had a lot of questions about why we substituted Marq. But Rapid is still adjusting to life on the farm. We figured putting him on a van, taking him to an event with loudspeakers, other horses, and lots of people…well, he’d think he was headed back to the track and get all worked up. And believe me, it doesn’t take much to get Rapid worked up: I merely drove past his paddock yesterday morning and he figured that was a sufficient excuse to rear, buck and kick a bit. You know, in case I was someone he needed to impress!!! The other horses at the farm are all doing quite well. The grass is amazingly green for late September and the weather is cooling off nicely. Seventy degrees and partly sunny is some nice horse weather! Keeneland’s October meet begins next weekend, so we’ll be busy for the next month before things quiet down as fall winds its way into winter. We continue to offer tours every day—call the office at 502-863-1775 for a reservation.